A window well is a semicircular-shaped piece of material, sometimes made of steel or stone, that is designed to block off the view of dirt or rock and allow the sunlight from the ground level to illuminate the interior of a basement. The window well helps the basement feel more like a ground floor. 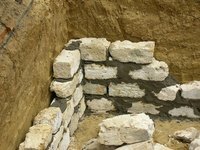 However, because of the nature of the well, water often accumulates inside it and can sometimes leak into the basement. The best way to keep water out of a window well is to use a window well cover. While this may seem like it would defeat the purpose of having a window well, it actually does not. A window well cover is a transparent cover that is installed over the window well and shields it from incoming water while still allowing light to come through. This is the most effective method of keeping a window well dry. Window well covers can also act as a safety measure to prevent people or animals from getting stuck in the well. A professional can install a window well cover for a reasonable price. If you do not want to hire a professional to install your window well cover and believe that the store-bought covers are too expensive, you can make your own window cover. You can make the cover either from a transparent flexible plastic, like a transparent tarp, or from a transparent solid plastic, like acrylic. Both kinds are easy to install. Lay or spread the plastic over the top of the well. Use a power drill to screw the plastic to the top of the well. It is best to allow the plastic to hang off the sides of the well a little to encourage the water to drain there rather than inside the well. If you do not feel that a window well cover is the right solution, there are other options. One way to keep water out of the well is to install a drainage system underneath the well to encourage water to drain into the yard or sewage system. You can also slope the ground surrounding the well downward, which will enable the water to leach out from underneath the walls of the well. A final option is to install rain gutters around the ground floor roof. This will prevent most water from reaching inside the well. However, this option will not help with snow buildup.